Now For Something Completely Different… Poinsettias! They have traditionally been the winter holiday’s most popular plant, the sure and steady standby, but have you seen poinsettias lately? These are not your mother’s poinsettias! 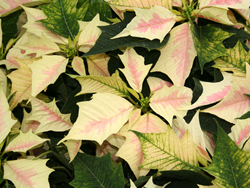 Endless selections of bract colors and shapes combined with unique foliage offerings and a wide variety of forms and sizes make this year’s collection spectacular. Furthermore, to fit the most unusual of tastes, poinsettias may be painted just about any color to match your holiday decor and finished off with glitter to complete the festive look. To use poinsettias as cut flowers, the stems must be treated right away. The milky sap must congeal inside the stems to prevent the plants from wilting. Immediately after cutting, dunk the cut ends of the stems into boiling water for about one minute and then immediately place them in cool water. Keep the flowers away from the steam to prevent them from being damaged. You may also singe the cut ends of the stems with a flame for a few seconds before placing them in cool water. Place vase of treated flowers in a cool place for at least 18-24 hours before they are used in arrangements. 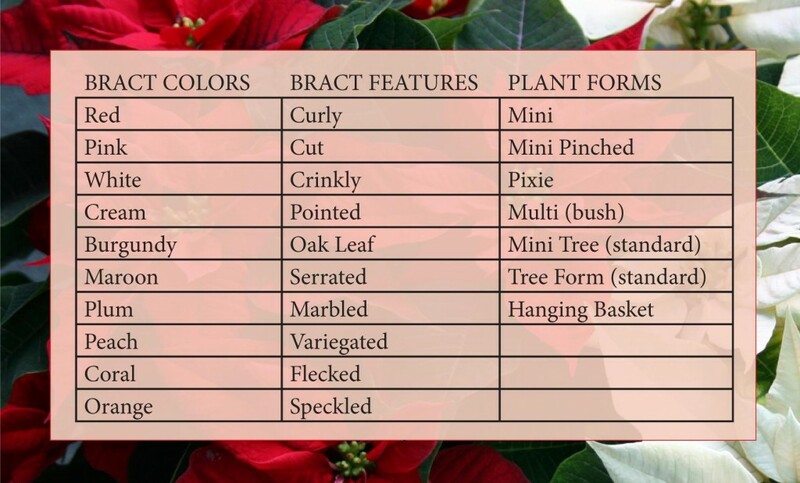 Other than their use as stunning holiday decorations, how much do you really know about poinsettias? Native to Mexico, the poinsettia was first introduced into the United States in 1825 by Joel Poinsett. 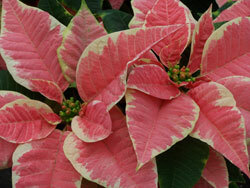 In its natural surroundings, the poinsettia is a perennial flowering shrub that grows up to 10 feet tall. The showy part of the plant, the part that most of us call flowers, are actually colored bracts or modified leaves. 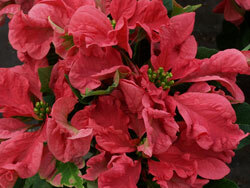 Poinsettias have been called ‘lobster flower’ or ‘flame leaf flower’ by many in the past. Poinsettias are mildly poisonous. The milky sap can cause a skin irritation for some and an upset stomach if consumed in large quantities. Poinsettias represent 85 percent of holiday season potted plant sales and are the best selling flowering potted plant in the U.S., even though most are sold in only a six week period before the holidays. 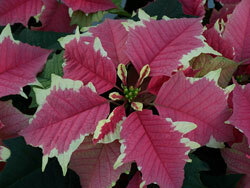 Dec 12th is National Poinsettia Day!